but our weather says summer. the sun is scorching hot so bailey is taking advantage of the shade and the cool lawn. thanks to ruckus the eskie and love is being owned by a husky for hosting thoughtless thursday blog hop. If it wasn't for the slightly cooler nights and slightly cooler days, by mid-day, even here in the mountains, it feels like summer to me too. Our weather has been so messed up here in Canada! One day you would swear it is winter, then the next the sun is shining and your out in a t shirt! 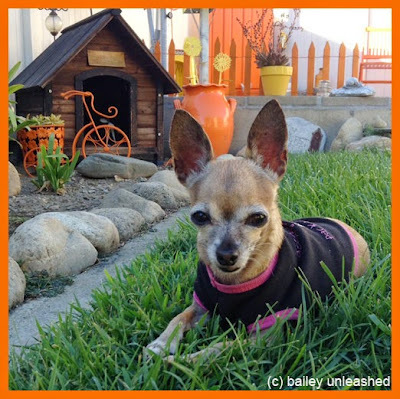 You look so relaxed and pretty in your beautiful yard with all that orange. Yes, it's time for fall now if only the heat would stop, we need cooler days. It is cooler here in the midwest this week but supposed to warm up again next week. it's not a sweater silly, it's a little t-shirt. she was only outside while i was watering the plants then we went right back in. she is cold with the air conditioner on, so she has to be in her tee. It has felt like fall around here, but starting tomorrow we will have a couple hot days again, so that fall feeling will go away for a time. You are oranged out! Happy Thoughtless Thursday!